All of the classes listed below are offered by Mary Waugh Swindell of Dancing Dogs. Please contact Mary for more information on these classes, the locations and the schedule. Registration for the 'Greyhounds Only' Dog Skills classes will be available via the GALT GreytStore. For all others, contact Mary directly through email or website. Our Dogskills 101 class is designed to improve your dog skills as a handler, and teach your hound the skills he needs to move from track star to beloved companion. We work on basic obedience skills such as sit, down, stay, and come; as well as behavioral issues such as leave it, counter surfing, stealing forbidden items, crate behaviors, housetraining and separation anxiety. Help your fast friend develop the skills needed to be a GREYT citizen. This is a six-week, one-hour class usually held on Wednesday evenings. For those greyt students who have completed the 101 class, our 102 session will help you polish your hound's skills, and prepare you for the Canine Good Citizen Test. Interested in pursuing pet therapy? Then this is the first step in helping your dog to become certified to visit hospitals, nursing homes, and performing some greyt public relations. Show the world your retired racer is a bright and shining star! Skills include increased reliability on sit, down, and stay, as well as practice coming with distractions, food refusals, politely greeting other dogs, sitting for petting, etc. Always wanted to try dancing with your greyhound? GALT's Advisory Director and Obedience Class Instructor, Mary Waugh Swindell, is looking for interested parties to have a Canine Freestyle class at Woofgang Doggie Daycare in Carrollton. If you've seen Canine Freestyle on Animal Planet, at some of her demos, or on TV and wanted to try, now is your chance! Five people are needed to have a class, so email Mary Waugh Swindell at dancingdobe@aol.com to ask about the next class! Class Description: Dance with your dog in the living room? Now it's time to take it on the road! This class is wonderful for teaching body consciousness to dogs, teaching backwards skills for Rally obedience, as well as a myriad of skills you can use for obedience, agility and just for fun! This class will teach your dog how to weave through your legs, how to flip backwards through your legs, heeling backwards and sideways, spinning, twisting and a whole lot more. We will work with various pieces of music to help you and your dog find the beat! This class is suitable for dogs of all ages and skill levels provided they love to learn and to have fun with their owners! Join Mary and Devon and practice the skills and steps that put them on Animal Planet. Bring your dog, treats, toys, and a sense of humor and be ready for a great time! With each dog disaster reported on the news and TV, our society worries about the safety of the dog population. What better great way to show off your pooch and to promote good PR for your breed than by showing that they are indeed a Canine Good Citizen! Many people also use the Canine Good Citizen test as the first step towards the Therapy Dog test, as it follows a very similar structure. Please contact Mary if you are interested in participating so that we can keep you updated on the next scheduled test. Dallas Dog Sports, www.dallasdogsports.com, is one place to check out this fun, fast-paced sport that you and your greyhound can participate in together. Agility is a timed event where you and your companion travel an obstacle course that includes jumps and tunnels, teeter-totter and a set of upright poles that the dog must weave in and out of. Dogs are judged on the accuracy of completing each obstacle and maintaining the proper course flow. You may choose to participate just for the fun of it, or you may decide to compete with your greyhound in one or all of several venues of agility competitions. Know how fast your hound is? Have you seen this on tv and wondered if you and your hound could give it a try. Think they could learn to jump, run through tunnels and put all that speed to good use! 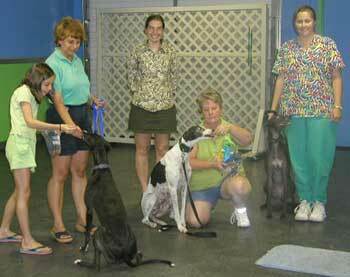 This special class is just for beginner hounds who are new to the sport. This fun, relaxed class is a great way to explore the fun filled sport of agility. Come jump, tunnel and scramble with us! Please contact Mary if you are interested in participating. Want to relax and just have some fun, develop some party tricks for those family reunions and barbecues? Teach your dog to balance a bone on their nose, shake, wave, and many more. Learn how to play "101 games with a box." Expand your dog's mind and enjoy their company playing and teaching them with the clicker.